This may be an elementary question, but I would like to get some clarity on this topic. 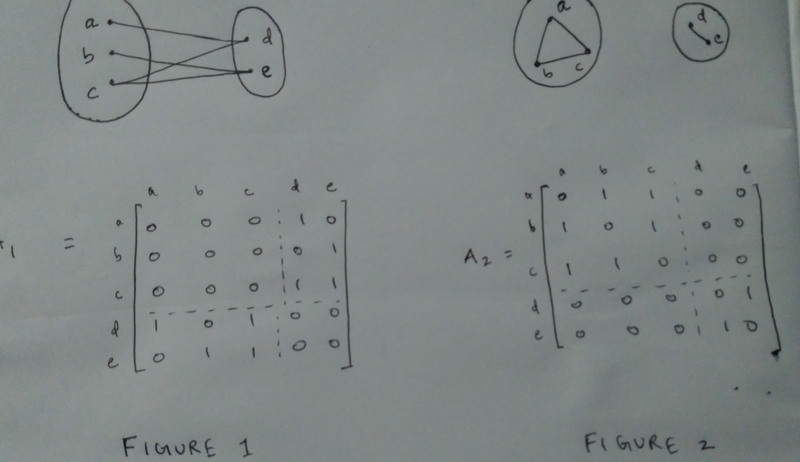 My question is about graph structure and its relation to the eigenvalues of the adjacency matrix of the graph. It is well known that for a bipartite graph, the adjacency matrix has a particular block structure (after properly reordering the vertices). A example is shown in figure $1$. Using this block structure, it can be shown that the spectrum of the graph is symmetric about the origin. Browse other questions tagged matrices graph-theory eigenvalues-eigenvectors spectral-graph-theory bipartite-graph or ask your own question. What does the spectrum of the adjacency matrix of a graph tell you? Non-bipartite graph with symmetric adjacency spectrum?